I graduated from normal snowman building fairly quickly when I was a kid. I thought it was more fun to make dinosaurs and monsters. My designs really leveled up when I realized I could incorporate icicles into them. They made fantastic monster teeth. Aim for a week of snowman jokes a la Calvin and Hobbes? PS, I’m also thinking Garfield for some reason. @ ZeoViolet: Maybe you’re thinking of the strip where Garfield built a scary snowman with olives for eyes and an ice cube tray for a mouth, right outside the window? That was one of two I’m thinking about. I would have built scary snowmen… If we only had any snow here in Sweden! >:( It has snowed *one* time so far this winter, and it melted as soon as it hit the ground! But I live in Skåne (in southern Sweden, for those who don’t know that much about Sweden), and I have almost lost faith in that I’ll ever see a *real* winter again! The last couple of years, we’ve had tons of snow… in March or even April! It’s almost like I live in an area where normal things never happen… Or at least the times of the year are waaay off. Kinda surprised that it’s a relativly normal snowman. Yeah, theres a Garfield strip with him messing with the mailman via a snowman. 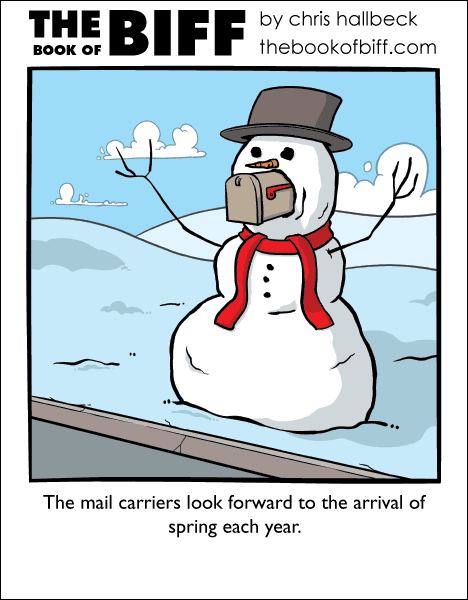 Garfield makes a similar snowman and it freaks out the mailman! That is one of two I was thinking about. Someone above mentioned the second one. Lots of icecicles on mailbox make for natural scary teeth.